Adaptable and clever, the whitetail deer is one of the most widespread deer in the country-found in all but five states. Known for their white tails that they raise when feeling danger, their hides change colors with the seasons, just like the leaves. Now, you can enjoy them in one of the most beautiful times of the year-winter. 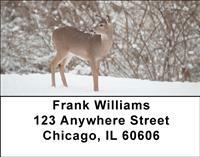 Everyone enjoys freshly fallen snow-is there anything more beautiful than the sight of deer in the white?